John Hussman, the outspoken investor and former professor who has been predicting a stock market crash, calls out a big mistake he says investors are making as valuations continue to climb. He sees this dynamic specifically playing out in the tech sector, which has been largely responsible for market gains in recent months, leaving them that much more vulnerable. In the stock market, the concept of valuation can mean different things, depending on the investor. To novices, it's frequently used as a simple barometer of when an investment gets overextended. Conventional wisdom there suggests once valuation gets stretched too far, it might be time to sell. But to seasoned experts like John Hussman — a former economics professor who is now the president of the Hussman Investment Trust — assessing valuation is more nuanced. He subscribes to what he calls the Iron Law of Valuation, which says the higher the price investors pay for future cash flow, the lower their long-term investment returns will be. In other words, if you arrive late to the party, don't expect to get the full experience. It's a relatively basic concept that informs Hussman's view that irrational investor behavior will eventually lead the market to its doom. Piggybacking off the Iron Law, he points out that as prices have surged, people still seem perfectly content chasing returns, as if they expect the rally to continue forever. Ever the market skeptic, he says such an approach is a big mistake, and creating a dangerous situation. "Market returns and economic growth have underlying drivers," Hussman wrote in a recent blog post. "At their core, extended periods of extraordinary growth and disappointing collapse reflect large moves in those drivers from one extreme to another. Extrapolation becomes a very bad idea once those extremes are reached." In order to showcase the dangers of such extrapolation, Hussman looks at a how a measure of price-to-sales (P/S) has looked for the S&P 500 during the two recent stock-market eras. From 1982 to 2000, when the equity benchmark was enjoying average annual total returns of 20%, the P/S ratio surged from 0.3 to an "offensively extreme" 2.2. The opposite dynamic played out in the period from 2000 to 2009. During that time, the S&P 500 fell by half as P/S declined from 2.2 to less than 0.7, despite strong overall growth in both revenue and earnings. Long story short, as P/S goes, so does the market. And then, when it gets to an extreme, it can abruptly change course, catching many investors off-guard. With that in mind, consider the P/S situation as it stands right now. It's at a record high of 2.4, having climbed from less than 0.7 in 2009. Based on historical precedent, that's a serious danger zone for equities. That fact informs the view currently held by Hussman, who also takes a shot at price-insensitive quantitative investors when providing his assessment. "Extrapolating the market gains of these past several years, as if they are somehow a birthright of passive investing, is likely to have brutal consequences for investors," said Hussman. The chart below provides a visual representation for why Hussman thinks these consequences could be manifested as a two-thirds decline for the S&P 500. 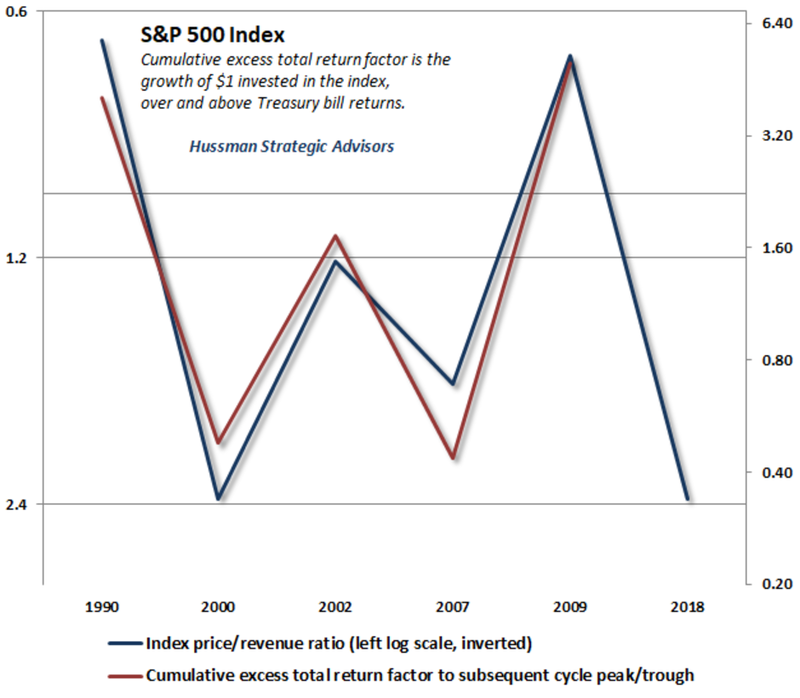 The red line shows the half-cycle return for the index, relative to Treasury bill returns. The blue is an inverse representation of the vaunted P/S metric. If the red line follows the blue one, as it has historically, Hussman says his forecast will come true. No discussion of highly-speculative valuations is complete without an assessment of the mega-cap tech firms that have driven so much of the market's recent performance. That means the so-called FAANG group, which consists of Facebook, Amazon, Apple, Netflix, and Google. To Hussman, they provide a perfect case study of just how willing investors are to ignore the Iron Law. "When companies are growing very quickly, investors tend to look backward, and as a result, they often apply very high rates of expected growth to already mature companies," he said. "When valuations are already elevated, this practice can be disastrous." The tech sector did absorb a scare of sorts this past week, as Facebook's stock tumbled 19% — erasing a US stock-market record $120 billion of market value — after forecasting slowing growth. While it's far too early to say if this was an isolated incident or an industry-wide affliction, the outsized damage seen by Facebook should be a warning to its peers. Hussman also points out that a revenue slowdown is already happening at Apple. He notes the company's sales growth rate, which has slowed to an average rate of less than 4% annually over the past three years. "Investors should, but rarely do, anticipate the enormous growth deceleration that occurs once tiny companies in emerging industries become behemoths in mature industries," he said. "You can’t just look backward and extrapolate. 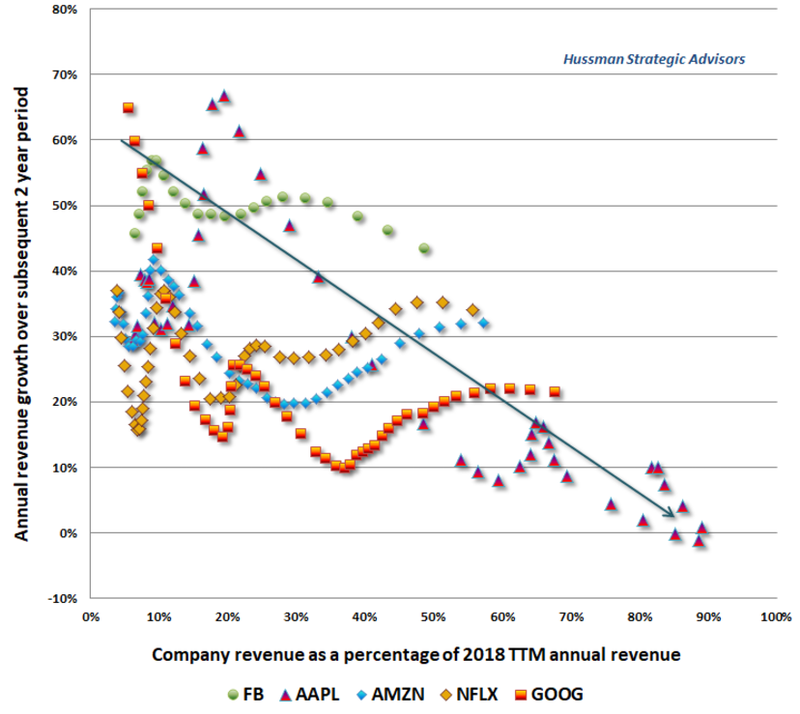 In the coming years, investors should expect the revenue growth of the FAANG group to deteriorate toward a nominal growth rate of less than 10%, and gradually toward 4%." This type of commentary shouldn't be surprised to anyone who follows Hussman. He's repeatedly made headlines by predicting a stock-market decline exceeding 60% and forecasting a full decade of negative equity returns. And as the stock market has continued its seemingly unstoppable grind higher, he's persisted with his calls, undeterred. So keep that in mind as you weigh your next stock-market decision. Hussman's doomsday scenario may not have transpired quite yet, but one would still be wise to heed his warnings. 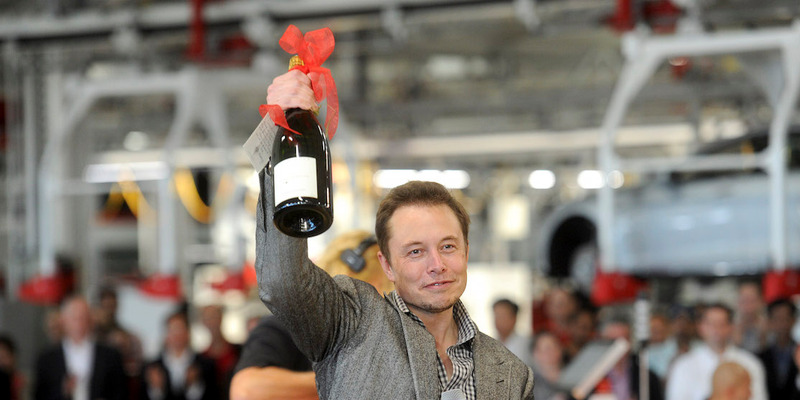 Tesla's stock has become 'somewhat of an Elon sentiment gauge," RBC Capital Markets told clients Monday. CEO Elon Musk has amassed a cult-like following on Twitter — and can often move the stock in 140 characters. Tesla on Wednesday managed to please anxious investors by posting a smaller-than-expected loss and burning less cash than Wall Street had anticipated. But also fueling the rise was an apology from CEO Elon Musk himself to analysts he had previously interrupted for "boring" and "boneheaded" questions — and the apology could have affected the stock more than you might expect. "Elon’s tone was generally improved vs. last quarter, which may seem trivial, but TSLA stock has become somewhat of an Elon sentiment gauge," RBC Capital Markets analyst Joseph Spak told clients in a note Thursday morning. Spak attempted to ask Musk about Model 3 cancellations on Tesla's first-quarter earnings call, but was cut-off in favor of a question from YouTube. Personality cult aside, Spak says Tesla's earnings on Wednesday leave some questions in his mind, but were in no doubt "a better quarter" with "a number of positives" that led him to raise his target price from $280 to $315 — about 4.5% below where shares were set to open Thursday. "2Q 18 results better than expected and we are more comfortable with 2H 18 profitability/cash flow," he said. "Further, there seems to be more ammo for bulls than bears in commentary. Given stock's propensity to sentiment/momentum, we could see a rally, but remain Sector Perform rated believing a lot priced in." 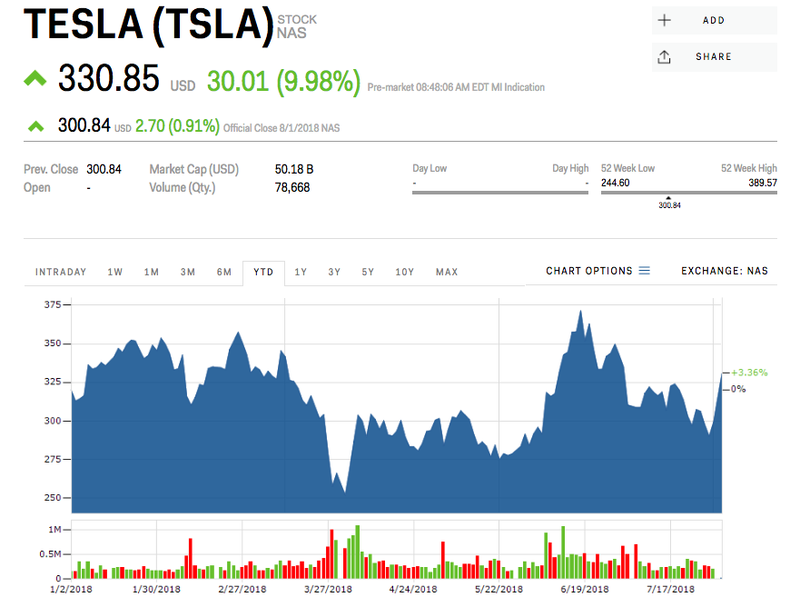 Tesla rallied nearly 10% following the earnings release, and is set to open around $330 Thursday morning. Shares are up 3.4% this year. The stock market is headed for a correction bigger than the February sell-off, Morgan Stanley's equity strategists said in a note Monday. A rotation to more-defensive sectors is gaining traction, and the recent decline in tech stocks is a sign of market exhaustion, they said. Michael Wilson, the firm's chief equity strategist, has said stocks are in a rolling bear market this year. 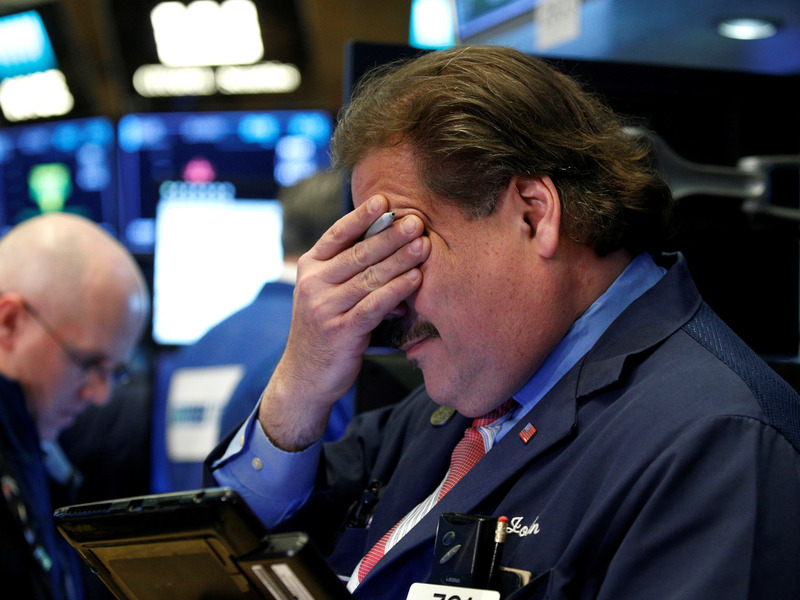 A stock market sell-off worse than the February correction is coming, Morgan Stanley's equity strategists forecast. 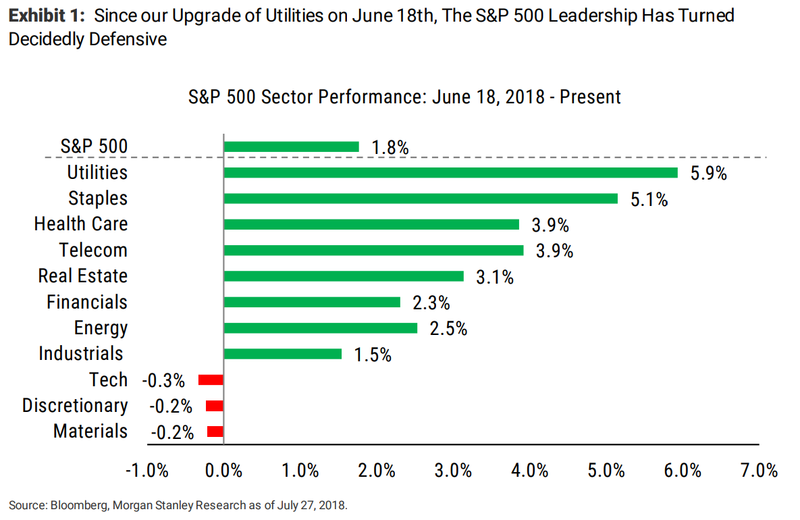 Earlier in July, they advised clients to turn defensive on the market in preparation for a rotation to sectors like utilities. They also downgraded the tech sector, making two decisions that even they acknowledged many clients weren't excited about. But the team led by Michael Wilson showed no sign of backing down on its views in its weekly note on Monday. In fact, the recent sell-off in tech, which led stocks lower Monday, only confirmed that the rotation to more-defensive sectors was gaining traction, Wilson said. "The bottom line for us is that we think the selling has just begun and this correction will be biggest since the one we experienced in February," Wilson said. "However, it could very well have a greater negative impact on the average portfolio if it's centered on tech, consumer discretionary and small caps, as we expect." It didn't help that Facebook and Netflix missed earnings expectations last week, with the social-media network setting a record for the biggest one-day valuation wipeout. Netflix tumbled into a bear market on Monday. Because the damage was mostly contained to the stocks with disappointing earnings, investors got "an even greater false sense of security in the market," Wilson said. But a strong report of US gross domestic product on Friday and Amazon's strong earnings left investors wondering what to look forward to. By then, Wilson said, "the market appeared finally exhausted." "The selling started slowly, built steadily, and left the biggest winners of the year down the most," Wilson said. 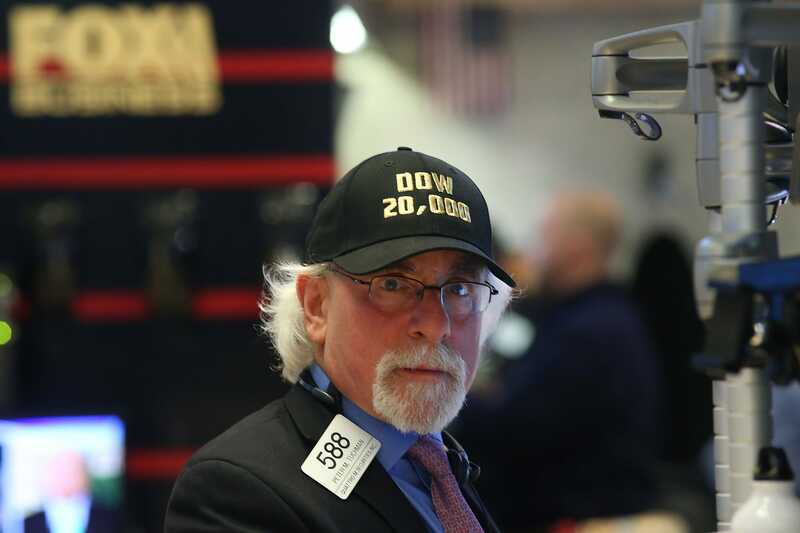 His observations are based on the broader view that the stock market is in a rolling bear market this year — a tougher environment to make money in. "Perhaps the best way to express our rolling bear market view may be to simply overweight value vs growth as we are currently recommending in our sector weights," Wilson said. Morgan Stanley is overweight utilities, energy, industrials, and financials. Wilson added that while this recommendation may mean ditching the popular momentum stocks that have led the market higher, it's worth it at this stage. 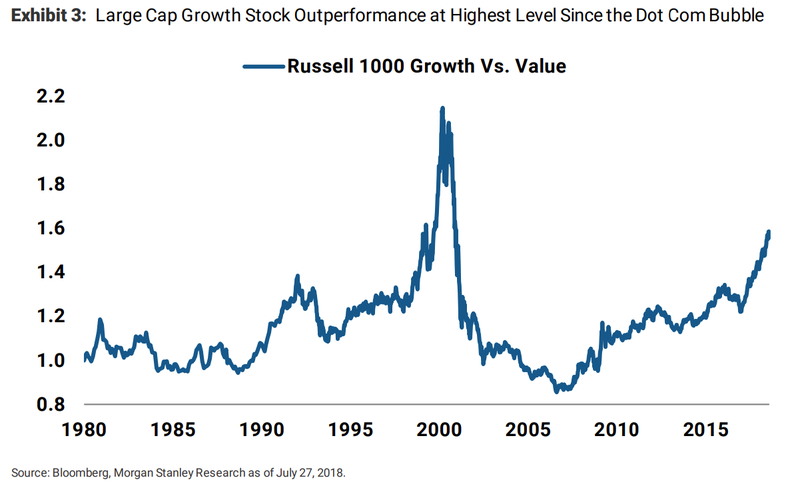 He noted that the outperformance gap between large-cap growth and value stocks was at its widest since the dot-com bubble. This gap isn't "justified" by forward growth and earnings expectations, he added. President Donald Trump is continued his threats to impose tariffs on all Chinese imports to the US. China's government put out a video featuring a soybean, seemingly pushing against Trump's trade policies. Follow soybean prices in real time here. As American farmers start to wonder how much President Donald Trump’s trade war with Beijing could cost them, China’s government has a cartoon soybean ready to answer their questions. State-owned China Global Television Network on Friday posted a video, first spotted by Reuters, seemingly designed to undermine support for Trump's trade policies. 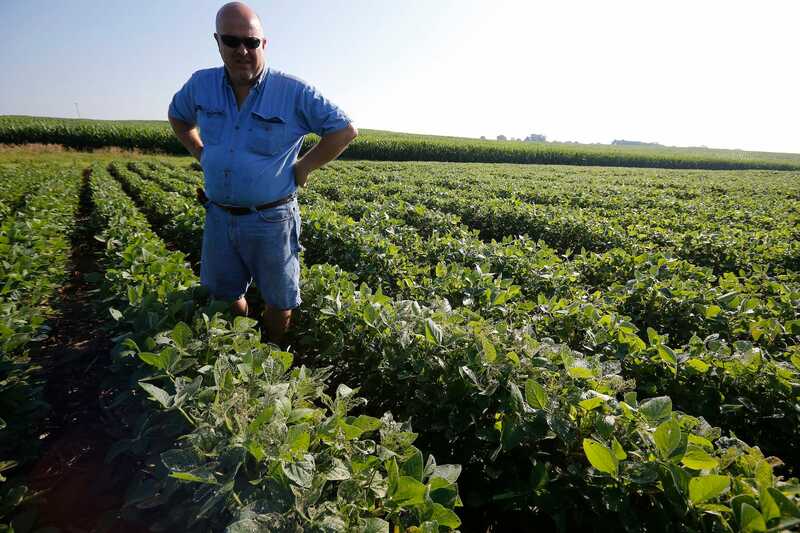 It points out the potential consequences trade escalations could have on American soybean exports, underscoring that China is the world's largest soy importer. "Hi, everybody. I am a soybean," the cartoon says in the video. "I may not look like much, but I am very important." Ahead of the upcoming US midterm elections, the English-narrated video seems to have a certain audience in mind. Nine of the top 10 soybean-growing states in the US voted for Trump, it highlights. "Trump wants to win over more voters by starting a trade war," the cartoon says. 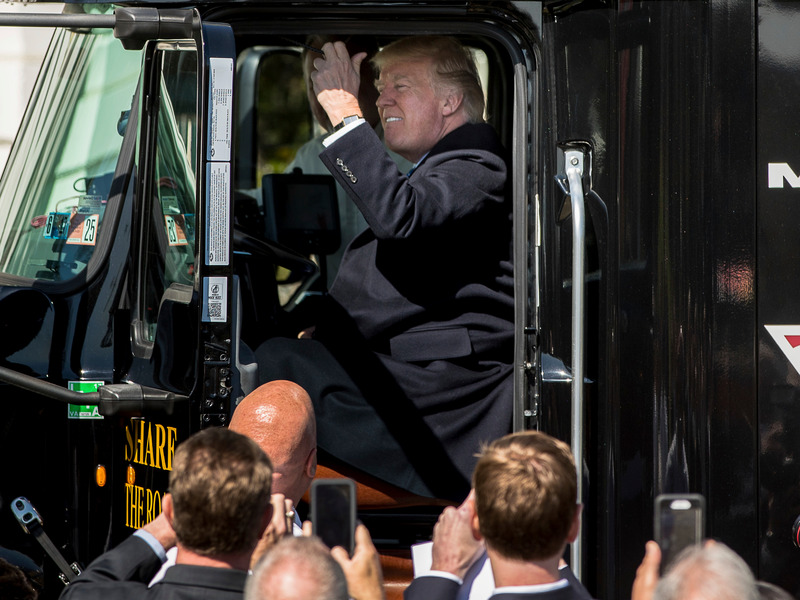 "The funny thing is that those voters who think Trump rally behind his trade actions will be hurt by this conflict." Trump reiterated threats to impose tariffs on nearly all Chinese imports to the US in a CNBC interview broadcasted on Friday. In response to a question about whether he would ever impose tariffs on $500 billion worth of Chinese goods, he said he's "ready to go to 500." The US imported about $505 billion worth of goods from China last year. The Trump administration imposed punitive duties on $34 billion worth of Chinese imports to the US in early July and said another $16 billion worth of electronics and plastics would be targeted after a public comment period. The move prompted Beijing to hit back with in-kind tariffs on American imports to China, including soybeans. 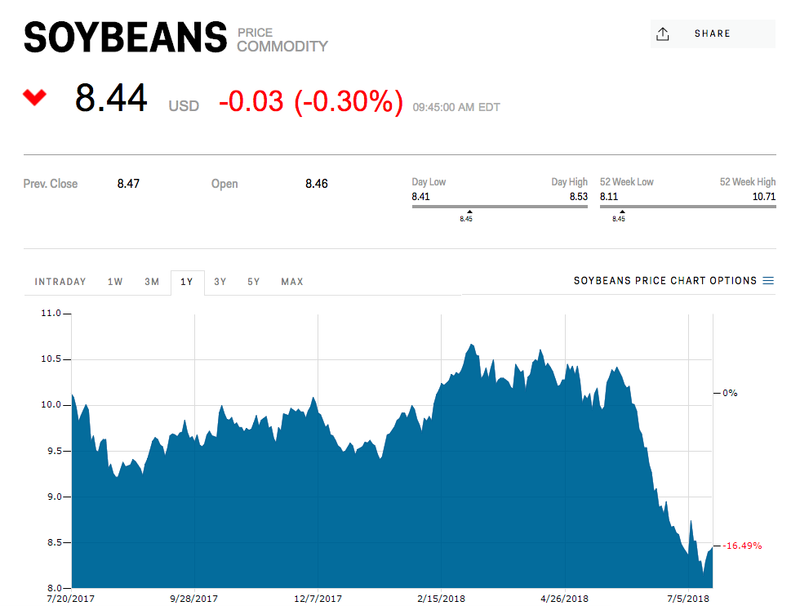 Soybean prices have fallen nearly 20% since March, when the Trump administration first announced plans to penalize China for alleged intellectual property theft and what the president sees as unfair trade practices. The Intercontinental Exchange (ICE) announced the launch of Bakkt, a new digital asset platform, on Friday. The move, which represents one of the biggest moves by a Wall Street firm into crypto, swept financial news. But many experts think headlines missed a key aspect of the plan, which could help bring the bitcoin market to the next level. The Bakkt platform, which will facilitate the trading of a physically delivered bitcoin futures contract, offering a regulated way to store bitcoin. This could lure big institutional traders to the market. "This is what the market has been crying for." David Mercer, the founder of UK trading firm LMAX, is typically critical of the futures markets for cryptocurrency. He doesn't think the underlying spot market is mature enough yet for a futures one on top of it. But he, like many other experts, saw Friday's news that the parent company of the New York Stock Exchange was launching Bakkt, a crypto ecosystem, as a positive step to the market. But it's not the fact that the platform might make it possible for someone to convert their crypto into USD to buy a latte at Starbucks that has Wall Streeters excited. It's something a bit more pedantic to the non-trading wonk. The first step in the platform will be a crypto futures contract that physically delivers bitcoin. Elsewhere, at rivals CME and Cboe Global Markets, bitcoin futures settle in cash. At the end of a futures bet that's cash-settled, a trader receives or pays the difference between the price at which they bought the contract and its settlement price. In contrast, with a physical-settled future, a trader would take their payment in physical bitcoin. As Business Insider previously reported in February, traders from firms like DRW, DV Trading, and B2C2 were clamoring for physically-delivered bitcoin futures. At the time, however, it wasn't clear whether such a set-up could exist because it require complex systems to store bitcoin. The fact that traders will be able to trade bitcoin futures that physically deliver would make trading less risky and would better facilitate an arbitrage trade, according to Garrett See of DV Chain, a crypto trading firm. If bitcoin is trading at a discount in the spot market relative to the futures market, a trader can go long bitcoin and short the future for a profit. This is hard when a future settles in cash because it requires a trader to make another trade. Max Boonen, the founder of B2C2, a UK-based crypto market-making firm, said that such a settlement infrastructure would be difficult to implement. "Basically the clearing houses and [brokers] would need a bitcoin infrastructure to transfer crypto," he said in an e-mail to Business Insider. Physically settled bitcoin futures would also need to get the green light from the Commodity Futures Trading Commission. "As an initial component of the Bakkt offering, Intercontinental Exchange’s U.S.-based futures exchange and clearing house plan to launch a 1-day physically delivered Bitcoin contract along with physical warehousing in November 2018, subject to CFTC review and approval." Aside from the fact that physically-settled bitcoin futures could make lives easier for traders, it could also point to a key development in the market. The thing stopping large Wall Street institutions from diving into the market right now are the lack of prime services — such as margin finance — and secure, regulated custody. "Bakkt is going to be a regulated custodian," an investor in Bakkt, who declined to be named, told Business Insider. The insider said every broker dealer connected to ICE would be able to connect to Bakkt and then trade, knowing their bitcoin will settle in their warehouse. "That’s massive. 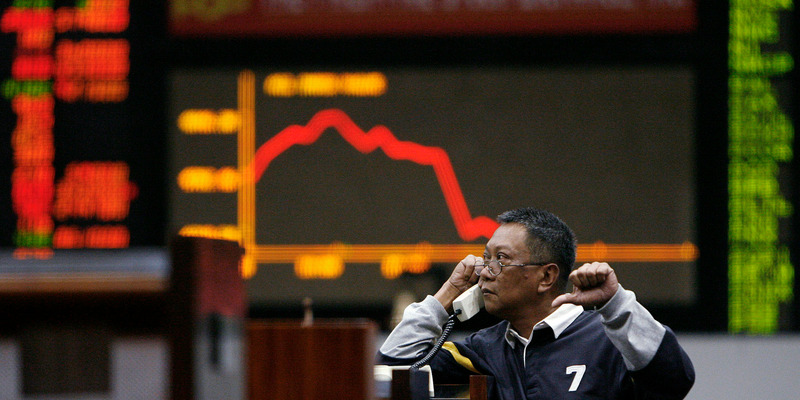 A very, very big deal," Patrick Rooney of Trading Technology said in a message. Officials of the Trump administration have said they want a weak dollar. The US government pushing for a weak greenback breaks with recent tradition. But 35 years ago, the Reagan administration worked with foreign governments to weaken the dollar. At the beginning of the year, Treasury Secretary Steve Mnuchin said a weaker dollar "is good for us as it relates to trade and opportunities." The move broke with the tradition of American officials publicly backing a strong dollar, and prompted President Donald Trump to say Mnuchin was taken out of context. But thirty-five years ago, the US government began taking part in coordinated efforts with allies to weaken the rallying dollar. Here's a brief look back at what happened. Why did the dollar strengthen back then? It all started in 1980, when the US inflation rate was in the double digits. In an iconic move that set a new precedent for central-bank policies in the US, the Federal Reserve under Chairman Paul Volcker doubled the federal funds rate to a historic high of 20%. 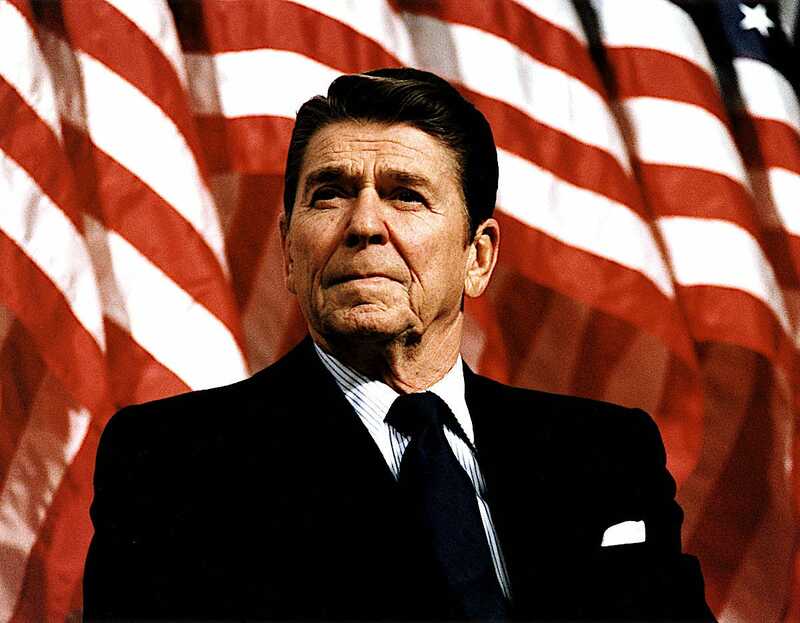 At the same time, President Ronald Reagan was pursuing a sweeping economic expansion through dramatic tax cuts and deregulation. That combination pushed up long-term interest rates, shored up capital and appreciated the currency. Double-digit inflation began to edge lower, falling to under 4% within three years. And the dollar more than doubled in value versus a basket of currencies — the Japanese yen, Deutsche mark, French franc and British pound — between 1978 and 1983. Why might a strong dollar face criticism? A strong dollar makes American products more expensive for overseas customers, so it can weigh on domestic exports. During the 1980s, the current account deficit widened to as much of 3.5% of gross domestic product, a historic peak for the time. Though major trading partners may have seen a boost in some exports, the strong dollar was far from received warmly abroad. Other countries complained American interest rates forced them to raise borrowing rates in defense of their currencies, which threatened to slow down economic growth in a time of global economic recovery. What did the US government do about it? Aided by European countries and Japan, the Reagan administration in late July 1983 began to intervene in foreign exchange markets. Those countries coordinated efforts to sell dollars and buy up other currencies. 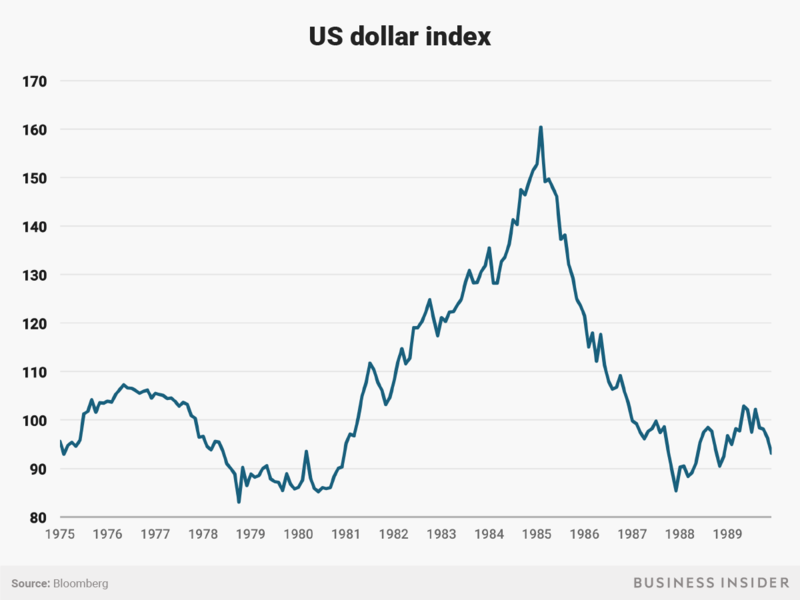 Efforts to rein in the dollar culminated in September 1985 when the United Stated, West Germany, Japan, Switzerland, the United Kingdom and France signed the Plaza Accord. The agreement marked formal efforts to depreciate the dollar, specifically relative to the yen and the mark. Supporters of English rightist Tommy Robinson, who was recently released on bail after a 13-month jail term for contempt of court was reversed, have donated nearly £20,000 in bitcoin. The level of Robinson’s support, which comes from as far as Washington and Istanbul, has alarmed organizations that monitor right-wing activities, according to the Evening Standard. It's unusual for US politicians to use policy to boost the economy just before an election, and the Trump administration seems to be doing just that, according to Ethan Harris, the head of global economics at Bank of America Merrill Lynch. Tax cuts and increased government spending are policies that are typically enacted to assist a recovering economy, not a robust one. Trump has also broken precedent by encouraging the Fed to keep interest rates low. Harris said he expects "bouts of nervousness in the markets when anti-Fed rhetoric ratchets higher." President Donald Trump's election injected confidence into Wall Street and Main Street, as business leaders anticipated lower taxes, lighter-handed regulation, and more government spending. 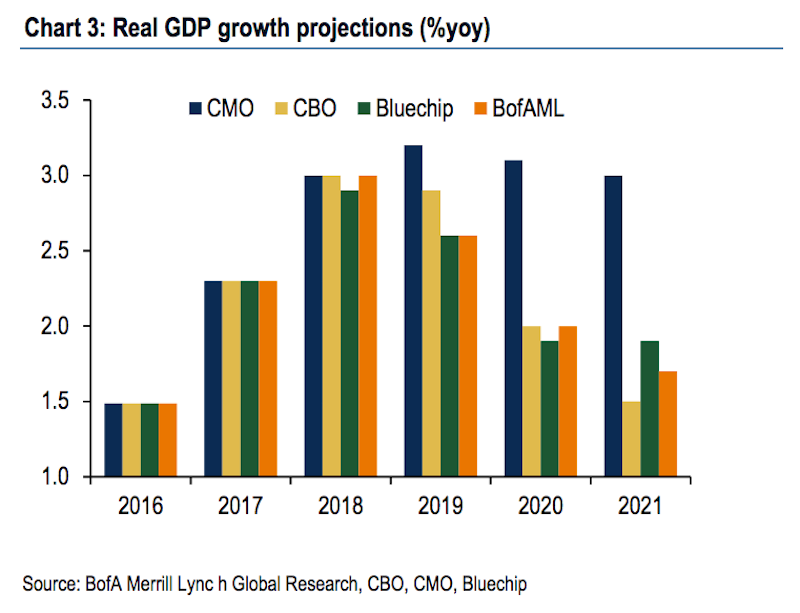 These pro-business moves represent the most coordinated policy effort to shape the economy since the 1960s, according to Ethan Harris, the head of global economics at Bank of America Merrill Lynch. And, they seem to represent a return of the so-called political business cycle, which describes what happens when politicians try to boost the economy just before an election, Harris said in a recent client note. Washington has tended to enact fiscal stimulus, including tax cuts, much earlier in business cycles than now to counteract trends already in place in the economy, Harris said. He also observed that the Federal Reserve, which directs money supply and the cost of borrowing, has grown more independent of the White House over the years. But the Trump administration seeks to use both fiscal stimulus and Fed policy to extend the business cycle, not to fight a downturn. And it's the first so-called pro-cyclical policy shift since the 1960s. "In recent years, politics and election cycles have played a small role in the US business cycle," Harris said. The most prominent parallel in modern history can be traced to 1966, when inflation started surging, Harris said. The Fed first raised rates to combat inflation, but backed down under pressure from Washington, leading to the so-called Great Inflation of the 1970s. Subsequent efforts by the Fed to quench inflation were ineffective until Paul Volcker stepped in as Fed chair in 1979. In a meeting weeks after his inauguration, President Donald Trump told former Fed Chair Janet Yellen he considered her a low-interest-rate person like himself, according to The Wall Street Journal. The meeting was private, but foreshadowed more public and direct comments Trump would make more than one year and as many as six rate hikes later. Of higher rates, Trump told CNBC in July, "I am not happy about it." "But at the same time I’m letting them do what they feel is best," Trump added. A White House spokesperson said Trump respected the Fed's independence. Still, his comments broke longstanding precedent of presidents not opining on Fed policy. He doubled down the following day, tweeting that Fed tightening "hurts all that we have done." He added, "debt coming due & we are raising rates - Really?" According to Harris, pressure on the Fed could intensify. The central bank's likely response would be to talk more about its mandate instead of altering policy. But even that added pressure alone on the Fed could unnerve investors, Harris said. "Growing budget deficits combined with Fed attempts to cool the potential serious overheating of the economy means higher interest rates, a stronger dollar and an up-down pattern for the equity market as growth first surges then slows," Harris said. "We also expect bouts of nervousness in the markets when anti-Fed rhetoric ratchets higher, and for the markets to price in at least some risk of significantly higher inflation. This should put some pressure on the inflation risk component of the term premium." The chart below has various forecasts for economic growth that show an expectation for US growth to peak in 2019. This is a preview of a research report from Business Insider Intelligence, Business Insider's premium research service. To learn more about Business Insider Intelligence, click here. Fintech broke onto the scene as a disruptive force following the 2008 crisis, but the industry's influence on the broader financial services system is changing. The fintech industry no longer stands clearly apart from financial services proper, and is increasingly growing embedded in mainstream finance. We’re now seeing the initial stages of this transformation. For instance, funding is growing more internationally distributed, and startups are making necessary adjustments to prove sustainability and secure a seat at the table. 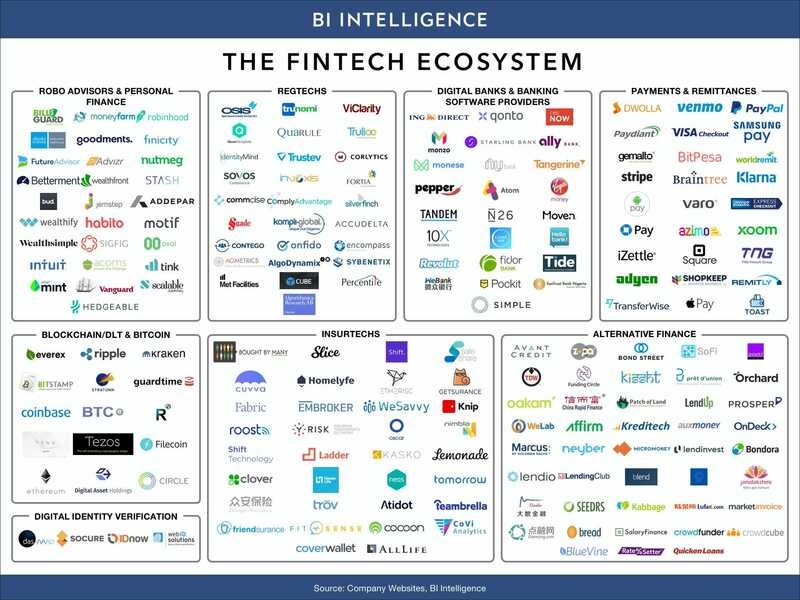 Most fintech segments in the ascendant a year ago have continued to rise and grow more valuable to the broader financial system. Meanwhile, several fintech categories have had to make adjustments to stay on top. New subsegments are also appearing on the scene — such as digital identity verification fintechs — as new opportunities for innovation are discovered. Significantly, incumbents are responding more proactively to the rising influence of fintech by making updates to their consumer-facing channels, back-end systems, and overall business operations. Most are realizing that the best way to adapt is to work alongside the fintechs that are transforming the financial services environment, either by partnering with them or acquiring the startups entirely. As fintech's power grows, incumbents will have no choice but to change in order to stay relevant and competitive. All around, fintech is becoming embedded in mainstream finance. Business Insider Intelligence, Business Insider's premium research service, has written the definitive Fintech Ecosystem report that looks at the shifts in the broader environment that fintechs operate in, including funding patterns and regulatory trends; examines the adaptations that some of fintech's biggest subsegments have had to make to secure a foothold in the financial services system; and discusses how the continued rise of the fintech industry is pressuring incumbents to make fundamental changes to their business models and roles. It ends by assessing what a global economy increasingly influenced by innovative fintechs will look like. The fintech industry is far more than a group of digitally native, consumer-centric startups, although they are, in many ways, becoming the new face of financial services. It's increasingly clear that fintech no longer stands apart from financial services proper, and is morphing into an integral part of the financial system. To secure their position in the mainstream economy, some of the main fintech subsegments have had to adjust their business models. These include neobanks, robo-advisors, and alt lenders. Other fintech categories, meanwhile, have instead found that current conditions are well suited to their original models, and are seeing largely smooth sailing, like regtechs, insurtechs, and payments fintechs. Innovation and dynamism is still alive in fintech too, with new categories still emerging. The rising influence of fintechs is having a dramatic effect on incumbents, from banks to insurers to wealth managers, pushing them to respond proactively to stay relevant. Incumbents are reacting to changes wrought by fintechs on three key fronts: the front end, the back end, and in their core business operations. As such, incumbents and fintechs are converging on a digital middle ground. As this happens, the fintech industry is on the cusp of becoming an integral component of the broader financial services ecosystem. But it will likely first have to go through a complete credit cycle, and survive an economic downturn like the one that set the stage for its arrival in 2008, for this to happen. Looks at how the environment in which the fintech industry operates is changing, and what that means for the digitization of financial services. Gives an overview of the main subsegments within the global fintech industry, and discusses which categories have had to adapt to survive, which have reaped benefits from their original game plans, and which new segments have come to the fore in the past twelve months. Outlines the adaptations that incumbent financial institutions have begun making to adjust to an economy that's inevitably shifting to digital, and in which tech-savvy fintechs are increasingly setting the standards. Discusses what the future of financial services will look like as fintech embeds itself into the financial mainstream.